Black Garlic Is The New Superfood With Amazing Health Benefits! When it comes to garlic people have divided opinions about it. So, you either love garlic or you hate it, there’s no in between. However, bearing in mind the immense impact that garlic has on the human body as well as taking into consideration the various nutritive compounds of garlic, I’m sure that you’ll find it easier to accept garlic as it is and implement it in your daily diet. Garlic is famous for a reason and I’m not referring to the obvious one, its notoriously famous aroma and strong taste, garlic has been present in people’s diets 5.000 years ago. However, what interests us, is its availability on the market as well as the many studies which have been done to just acknowledge the fact the garlic is a must-have on our kitchen counter. This bulbous root plant is from the same family as the onion, however garlic draws more attention because of its specific looks, intoxicating flavor and taste and most of all, because of its unbelievably numerous health benefits. Many people are unfamiliar with the compound allicin, which in fact is the most powerful and significant compound of garlic. Allicin is a natural antibiotic, which is the main ingredient responsible for the anti-bacterial, anti-fungal and anti-viral properties of the garlic. Allicin is consisted and found in raw garlic, but not as a separate compound, but it’s created from a reaction, when the garlic cloves are being crushed. This compound is sulfur-rich and capable of destroying all the toxins and bacteria from the organism and so powerful, that it can provide a full detox of the organism. Moreover, the chemical reaction occurs when the tissues are crushed and allinase and alliin react, forming the so wanted and needed allicin. Allicin is also responsible for the intoxicating fragrance of this plant, however, it doesn’t stay forever. Meaning that after an hour or so, of the crushing of the cloves, allicin breaks down and it’s difficult to get active levels of allicin. The same applies for cooking or other methods of preparing garlic, they can cause a breakdown of this powerful compound, so why not consuming it raw? The best way to ensure that you’re getting active levels of allicin, is to consume garlic raw or crash it by chewing it. It can be an unpleasant experience, however this is nothing compared to the benefits which you’ll get from it. Apart from this potent compound, garlic has been identified to possess other powerful compounds, which some of them are a result of the allicin’s breakdown. However, it’s not known which compound is responsible for some health benefits and which ones are responsible for the others. Nevertheless, we know that allicin is for sure responsible for the anti-infective properties of the garlic, which is normally to assume the other health benefits origin from the other sulfur-rich phytochemicals. Extremely potent plant which can shake, detox and cleanse your whole body. The excruciating blend of ingredients in garlic, is what makes this plant so special. It’s rich is vitamin C and B6 as well as loaded with minerals such as calcium, manganese, selenium and phosphorus. Garlic will cleanse your organism and make a full detox of your body, getting rid of toxic heavy metals, such as arsenic, lead and mercury. Garlic is also beneficial for reducing inflammation and due to its anti-bacterial, anti-fungal and anti-viral properties, it protects our immune system from the outside influence. Garlic is also notoriously famous to be beneficial for 14 types of cancer cells, such as lung, breast and brain. It is a powerful antioxidant, which is proven to be beneficial for more than 150 diseases. Are the Garlic Supplements a good substitute? Some people are also using supplements and there are garlic supplements available out there. However, the supplement can never replace real food or it can never provide you organism with sufficient amount of nutritive compounds as raw fruits and veggies can. So, even though supplements are recommended in some cases, they can never perform as well as raw garlic. In other words, they can never form allicin in our bodies or form a small insignificant amount of allicin. Therefore, regardless of the fact that many supplement manufacturers choose to label their product as “allicin potential” this doesn’t indicate that allicin is produced or the quantity that it’s being produced is also unknown. So, bearing in mind that allicin is produced when the cloves are being crushed, the best thing to do is to rely on raw garlic consumption, rather than on the garlic supplement. How black garlic is made? The creation of black garlic starts when the white garlic bulbs are placed and kept in a temperature of about 170 degrees for 30 days and what you get after this process, is black garlic which is so nutritive and potent, that everybody is trying to lay their hands on it. The main ingredient for its preparation is white garlic, nothing else. After the 30 days of preparation, black garlic is ready for consumption and it also differs in taste. It has a sweet taste and a soft texture, often resembling to the soy sauce and balsamic vinegar. White garlic haters will love the following fact that black garlic is free from the strong odor as well as the intensive taste and spice. So, it’s only normal to assume that black garlic, due to the transformation it undergoes, will have a totally different set of compounds from white garlic. The most interesting fact is that black garlic has potent and numerous antioxidants, however it’s low in alliin. Black garlic has been proven to contain double the antioxidants compared to white garlic and this is probably due to the process which black garlic undergoes. Another powerful compound found in black garlic is known as SAC or s-allylcycteine, which is known and convenient for inhibition of cholesterol synthesis. SAC provides the organism with numerous health benefits and it’s considered as an extremely powerful ingredient. Well, once the garlic begins to sprout, the right thing to do, is to get rid of it. Well, it seems that the right thing to do is to preserve that type of garlic because it is proven that sprouted garlic contains more antioxidants than fresh garlic. The same explanation applies to sprouted garlic as to black garlic, because when a plant undergoes a process it also changes it compounds as well as properties. Sprouted seeds have a great nutritive value and by implementing sprouted plants in your daily diet you’ll increase the intake of vitamins, minerals, amino acids and many other important compounds. Sprouted plants will provide your body with numerous health benefits, such as fighting bacteria and viruses, due to its anti-infective properties, alkalinizing properties, promoting cell regeneration and powerful antioxidants. White Garlic vs. Black Garlic- Which one is healthier? Whether you are a fan of garlic or a strong opponent, you can’t deny the fact that garlic’s nutritional value makes your head spin. The numerous health benefits provided by garlic is what’s worth the try and you’ll definitely won’t regret it and you’ll feel the positive results since the first week of consuming this miraculous plant. However, after black garlic entered the world and became instantly famous, people have troubles deciding whether to choose black or white garlic. No need to worry, because regardless of the choice you make, you can never go wrong because white and black garlic are both extremely nutritive, incredibly healthy and provide you organism with various nutritive ingredients. 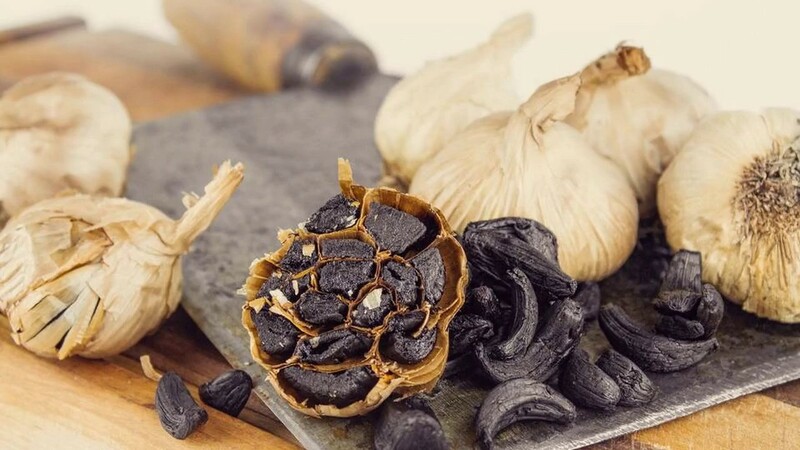 The difference may be noticed only in taste and looks, and like previously mentioned the specific odor and spiciness are gone in black garlic and maybe that’s why people prefer to try the new black garlic, which offers more or less the same nutritive ingredients. Moreover, allicin can be formed by crashing white garlic and you can never get that from the black garlic. You can make a combination of these two and experiment in the kitchen, you can definitely get creative and experience the benefits that garlic has to offer.